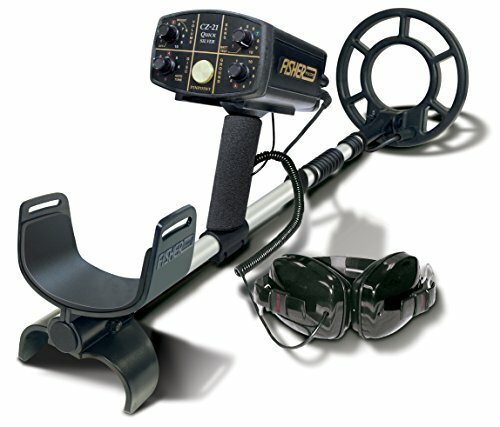 Underwater Metal detectors are among the pro-level devices and therefore quite an investment to make. They usually cost figures close to and upwards of $ 1,000. These devices are commonly amphibious being partly able to function in water and on land. The most important features for these devices is the depth they can scan underwater. These detectors are among the best you can get so you can be assured of the quality of these we have in our review section here below! The device uses a unique Broad Band Spectrum technology (BBS) which works at frequencies ranging from 1.5 kHz to 25.5 kHz. It is described as an amphibious machine owing to the fact that it is ideal for both land and water. It can be used in salty water thanks to a superior ground rejecting feature and underwater depths of up to 200ft deep. It can also work for the beach and wet sand because of the ground cancelling; forget about ground mineral content. The device has Receive Coil Boost (RCB) which amplifies target signals inside the coil which are weak thereby reducing the noise and finding weak strength or signal targets. It also has high visibility fluorescent body works for enhanced visibility underwater and a skid plate with the same feature. There is a side mount shaft which can be used when sweeping on shallow waters such that it can be done as surf-wading. This one is available as an accessory which is optional. It works using a Nickel MH rechargeable battery pack that lasts for almost 12 hours. 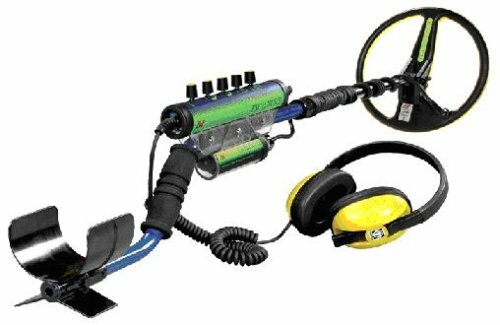 Garrett sells it as a waterproof device that works well in shallow waters and beaches and for depths of up to 200ft when using submersible headphones. The device sports a 10”*14” DD submersible search coil. Purchase includes two alkaline AA batteries that are good to go and headphones for use on land. It also has an instructional DVD to make your work of learning easier. It has an all metal Deep seeking mode which guarantees the identification of every single metal as a target. The audio tone ID can help you determine which one to go after and it is adjustable too. It has top-notch discrimination and works using the latest pulse induction (PI) technology. It works at full frequency range of the technology which for this one is 96 frequencies. Other features include an adjustable ground balance for ease of use literally anywhere on earth, automatic ground tracking for the same purpose and hip mount control and belt. It equally has box microprocessor controlled salt elimination, a feature in PI devices that makes it easier to use in salty waters and mount PC board technology. Fisher recommends it for beach hunting shallow water or lake hunting and surfing or diving. The latter two are because of the fact that the device can be submersed in water to a depth of 250 feet. The MD can work in both salty and fresh water, it is a Pulse induction technology machine that works on dual frequency and that is 5 kHz and 15 kHz. In this respect, it has a Fourier domain signal analysis feature. The 8”*10” search coil really outdoes itself. Its functionality is user friendly as it is finished with the use of touch buttons. There is vco no option and precise pinpointing for enhanced precision during hunting. The device also offers easy manual ground balance for use in virtually any place regardless of the mineral content in soil for instance. It has an all metal audio tune mode that detects very many metal with a large target alert and a faint target audio boost to give you an upper hand while sweeping. A 3 tone audio target identification also boosts those specs. As if not enough, the option of removing the control housing for belt mount is also available. The detector uses microprocessor technology to provide amazing water and land specs. 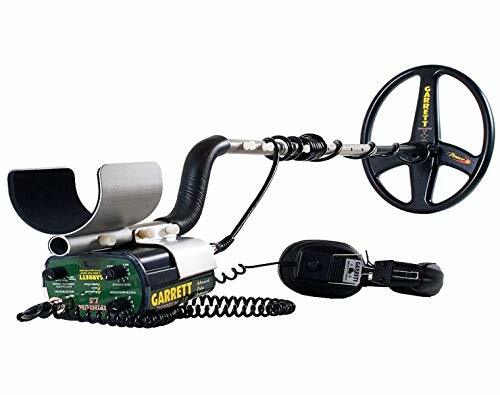 The 6lbs device has an 8” open-faced concentric search coil which is suitable for coin and relic hunting just like any other land use detector. The coil on this model can be interchanged with 7” and 10” ones for your convenience as the user. The shark works at a frequency of 12.5 kHz. It is waterproof up to 200ft thereby allowing its use by divers and surfers. For diving, the center pole will just be removed and voila! No need for buying another pole. The pole has two mounting positions for balance and 3-piece hip mountable breakdown pole for versatility in surfing and ease of storage and transportation. It uses 2 AA alkaline batteries which are included in the purchase with battery lives of 10-2- hours. The drop-in design of putting the batteries in the device implies no leads to break which is really good to know. There is a switch for testing the battery. The audio can be switched to silent or an adjustable threshold tone. Product Dimensions: Coil Size 10"
This is one device that comes packaged for the detecting enthusiast like no other. The Scuba mate box has the divers in mind. There is a headphone jack for use with the underwater headphones which can be submerged up to 200ft. there are knobs for adjusting discrimination or trash elimination and sensitivity, threshold and power levels. The box also has straps for attaching it to a wetsuit. The detector can be configured in four ways: the long stem with variants based on the location of the scuba mate box i.e. at the cuff, waist and at the top and a short stem for diving. The 3lbs device can be submerged to 200ft and works on a microprocessor tech with advanced pulse discrimination capability. 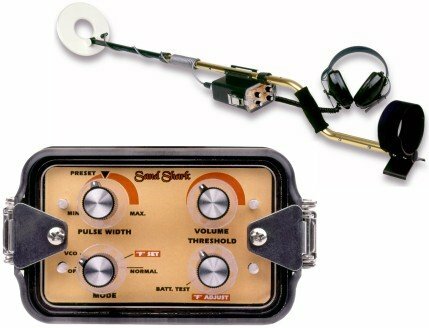 This detector is versatile and though made for the land, can be submerged, with the control box, for up to 10ft. underwater headphones might be a wise buy in such a case as the ones included are for use on land. The product features electronic pinpointing for precise location of the target and speedy recovery. It also has accept/reject discrimination for modification of discrimination patterns. There is continuous depth indication for coins and other targets. The device has sic search modes which can be customized or preset. There is also an expanded target identification legend which is easy to read above a large LCD screen. It comes with a 10” search coil with an automatic turn-on-and-go operation for easy use and a 2 year warranty that will make you want to have it. It can work in salt water, fresh water and on land. It is leak proof until 250 feet are reached. For the underwater use, a belt mount can be used. Aside from these, it has a patented quartz—crystal circuitry that offers up to 75 hours of battery life and ignores small pieces of trash by discrimination. It uses a target strength LED. When it comes to going under the waters, one has to be certain that the device in question is actually waterproof. Many devices out there claim to have this functionality but tend to be only semi-waterproof. What do I mean? Well, some devices only have waterproof materials coating them externally bad then claim to be waterproof. Thing is the components that comprise the machine are not and therefore there is a limit in the depth they can withstand underwater. Such devices are useful for wading in shallow waters such as beaches and swamps that are very shallow. They cannot therefore be used for scuba diving or surfing or even at sea. Their surfaces will give in to the waters. The second thing about them is the technology at play. 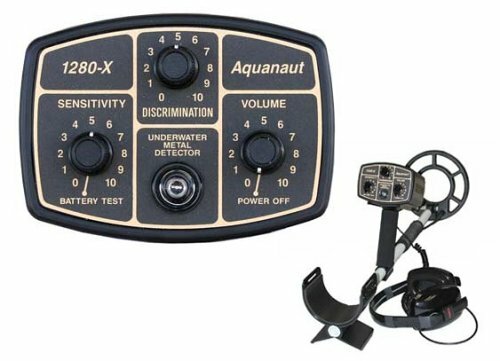 While most underwater devices function in pulse induction technology (save for the Excalibur which runs on Broadband), the semis work on very low frequency (VLF) technology. The perk here is that pulse induction (PI) is an advanced technology that offers greater depths of discrimination and sensitivity by far in comparison to VLF. Having a VLF masquerading as a PI will get you nowhere as the demands will be too great for it to achieve. The PI can scan sea beds for deeply seated metals that have been buried down by sand over time while VLFs will merely just comb the surface. This is a major setback that will definitely get you thinking twice about the product to purchase. Most of the common brands have at least one true underwater device. Each on has its strengths when put up against the other and therefore none really stands out to create a line of these devices only. Be on the lookout therefore for amazing deals such as warranty on goods and parts for periods of time at least longer than two years since you are paying for it anyways. You should also ensure that the display is user-friendly enough to be used underwater. 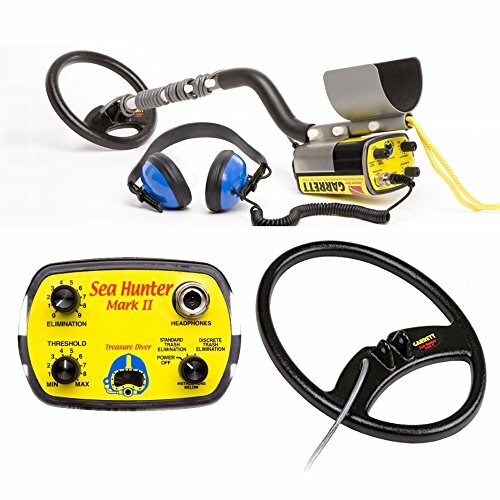 You could also follow up and find the ones with lights or enhanced visibility under seas because you know the benefits of being actually able to see where you are detecting. A pulse induction search coil that is amphibious is a cool thing. Not only can it comb deep sea beds of salty water, but can also search land with unmatched capacity. This can prove to be quite a catch for any one. When out hunting, you will realize that most brands bear this in mind hence have created ways of modifying the device to suit this. The control box can for instance be detached and tied to the arm or waist underwater then detached to be reattached to the shaft when on land. This is an enviable and unmatched plus when the devices are put to task. On the audio, does the device have a way of notifying you of the target in a way you can actually hear? Does it vibrate or ring? Is this possible underwater too? If not, will the headphones work? Are the headphones part of the purchase? All these are questions that define a wise buyer. 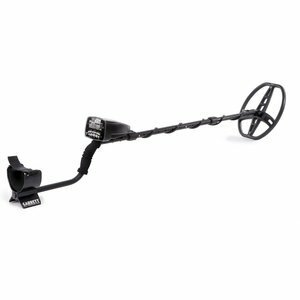 So before you make a buying decision on the best underwater metal detector you have to read metal metal detector reviews and read our buying guide so you can find the best fit for your needs.